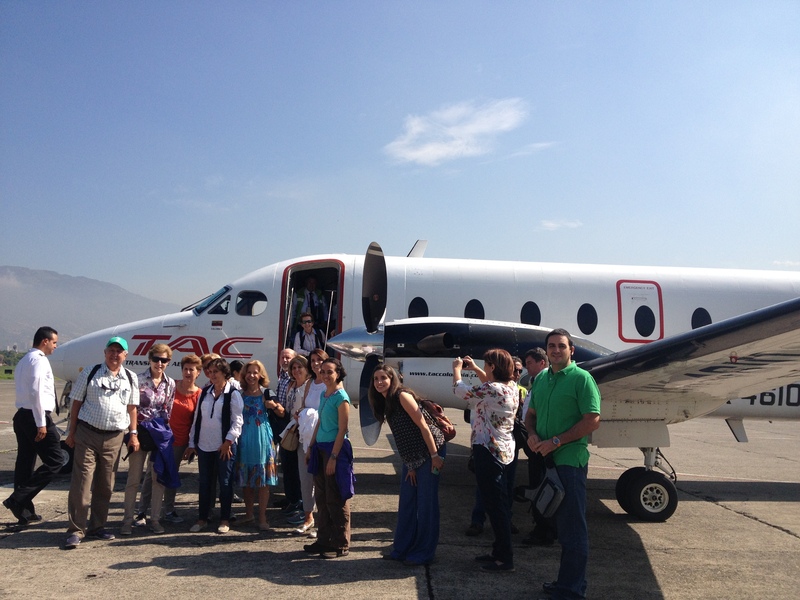 The company offers a couple different trip options – but I thought the trip on a chartered plane directly from Medellin sounded the most interesting, so that’s what I chose. There were 19 of us on the trip out from the airport in central Medellin (Enrique Olaya Herrera airport) – all Paisas (Medellin residents) except myself. Immediately, all our my fellow travelers embraced me – as they were entrusted by the travel agent to ‘take care of the gringa’. It was very endearing, actually. There were several nurses on the trip – so we bonded right away.. So it was at little sad – when arrived and they mixed and subdivided our group with another smaller group – except that they all turned all be awesome too! 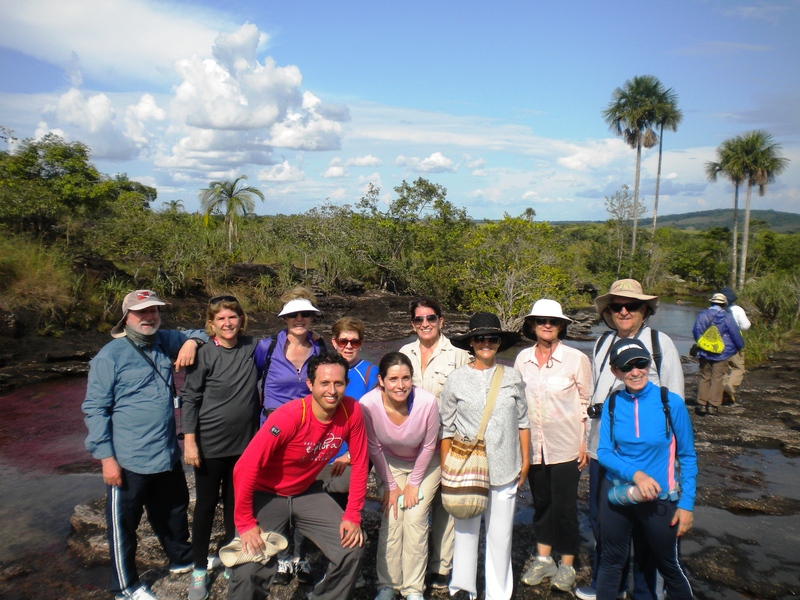 So I ended up as part of a group of six – (including our guide, Sergio).. For someone who wanted to learn more about Colombia, I couldn’t have created a better group. In our little band, there was a biologist, a microbiologist, an anthropologist and a meteorologist – and it was all random. Everyone was from Medellin and they had all come to enjoy the park. After arriving, we headed down to the Guayabero river for a boat trip to the first part of the hike. As I mentioned in a previous post – I left my trusty Nikon (and polarized lenses) back at home so these photos don’t even begin to capture how beautiful it really is. One of the best times was swimming near a waterfall in the middle of a torrential downpour.. Unfortunately, my camera had already taken a bit of a swim downriver so I don’t have any photos.. (But I did manage to salvage the photos and the camera – with help from a bag of rice). on the way back to the river from the trail we got to see the traditional Colombian way of life here on the plains as the cowboys were rounding up their herd. Just as we were walking to the boats – we saw a group of people staring at something on the ground. As we got closer, I saw that it was some kind of furred animal. Was it a goat – I couldn’t tell. I was initially reluctant to get closer – it looked half dead laying on the ground in the blazing sun, eyes dull and glassy. But as I got closer, it started to move – and it wasn’t a goat or barnyard animal at all. What the heck was it? I didn’t know but it looked sick to me.. 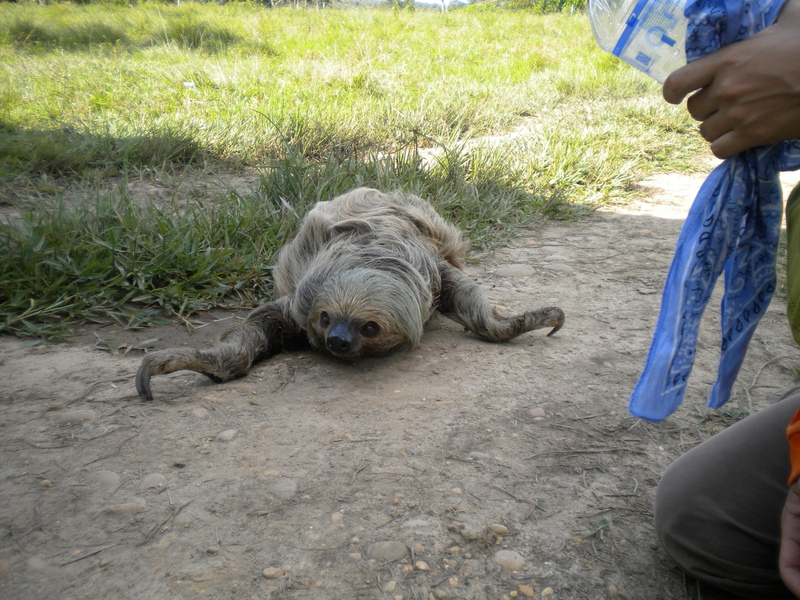 It was a perezoso (or Sloth in English), which had wandered out of the nearby forest and was now lost. and then this “half-dead creature got up..
and walked to a nearby table.. The biologist in our group immediately organized the group to entice the animal on to a tree branch, to carry across the field, out of the heat and the sun into the forest. (It felt about 20 degrees cooler when we got there.) The animal perked up and quickly climbed up into a tree. Because it’s coat matched the branches, it blended in perfectly. Within just a few minutes, it was greeted by another sloth high in the tree. Readers will quickly notice from the photos that there is a heavily military presence in the area. 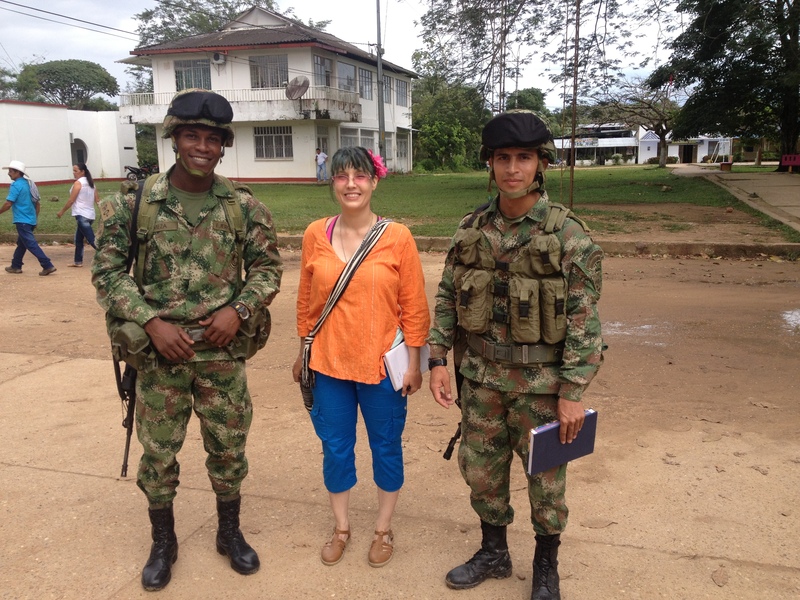 Despite a history of mixed relations with the Colombian military – including the discovery of a mass grave in 2010 with over 2,000 unknown corpses (and a history of some atrocities towards Colombian citizens), I am happy to see them. I know I am ignorant and naive, but their presence in La Macarena makes me feel safer. This area, in a lot of ways is kind of like Colombia’s own Vietnam conflict (in their own territory). 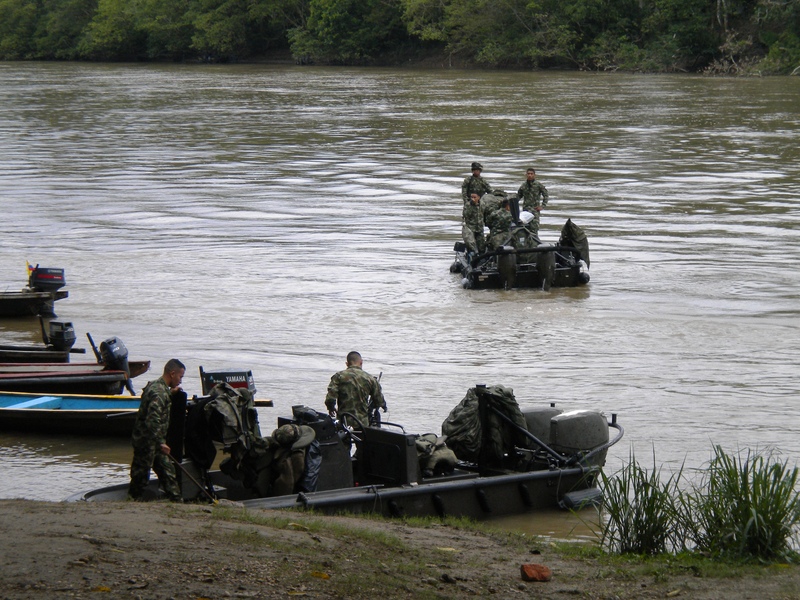 I feel bad talking to these soldiers who are far from their homes; I’ve met soldiers here from Cali, Boyaca, Bogota and all other points outside of Meta. This is nothing like Bogota (obviously!) and it makes me sad for them. Do I feel better knowing they are around?? 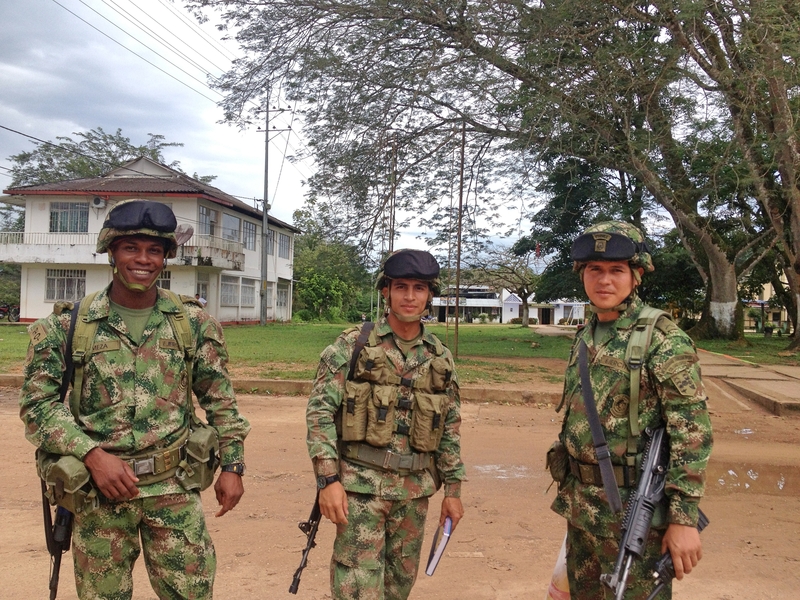 Most people from outside Colombia worry about the FARC, but right now – with the FARC in peace negotiations, paramilitaries like ELN and AUC are the bigger problem. These violent groups clash with everyone who gets in their way; townspeople, the army, and even the FARC. So anyone (like the Army) that keeps them at bay – is well, awesome! 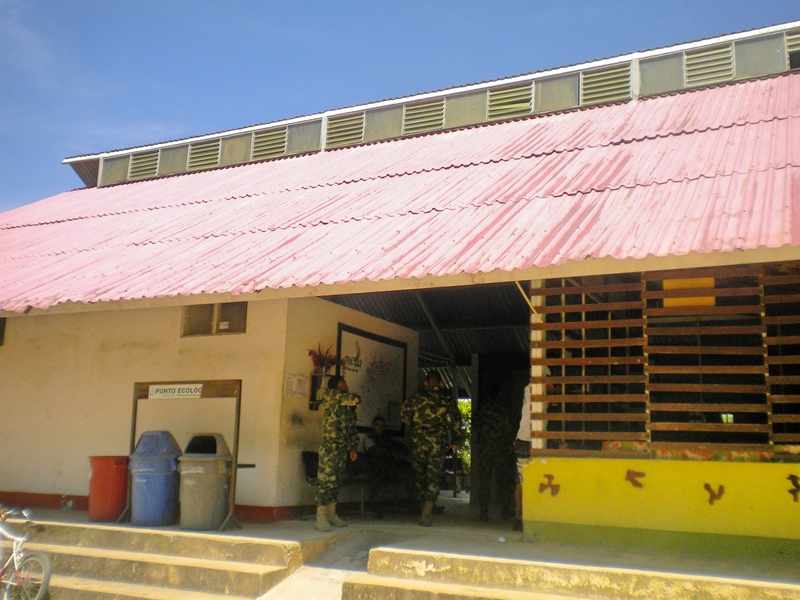 While both the governmental tour agency and the military officers I spoke with report that there has been minimal paramilitary activity in the La Macarena area for the last several years (8 to 10 years is what I was told), the Colombian state of Meta has an active area for paramilitary activities for the duration of the 50+ year conflict. I found only one fairly recent report (August 2014) of paramilitary activity in other parts of Meta. The majority of reports date back to 2006 – 2010, so it’s been fairly quiet lately. 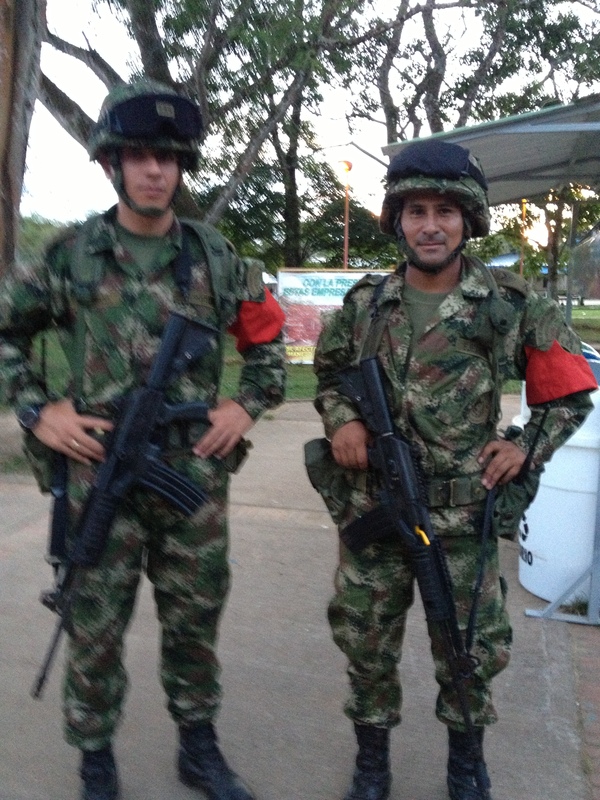 Even so, it’s good to know that there are 2500 active duty soldiers in the area surrounding La Macarena. 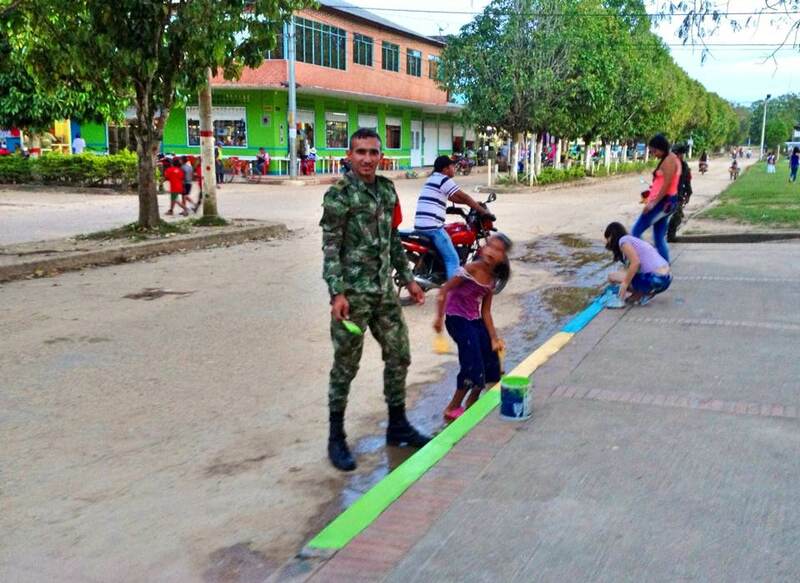 It’s quiet enough that some of the soldiers spend time performing community activities, like helping paint the town, which is one of the local projects to enhance the image of La Macarena for tourists. Aside from the large military population, La Macarena is a small little village – with just a few paved streets at the center of town. Most of the buildings are squat and square with a few second story and one tall four-story hotel tower..
We spent the evenings watching local entertainment – singers and dancers or enjoying a cervecita while playing tejo and enjoying the cool evening breeze. Long time readers know that I am addicted to the capital city of Colombia. So there was no way that I wasn’t going to take a few days to head over to Bogotá the moment I had a chance. I just got back – and before I head off on my adventure to La Macarena tomorrow, I thought I’d post an update. Since I was just stopping in for a few days, I decided to forgo renting my usual apartment. It’s a good thing I did or I would have missed out on getting to know the folks over at Charlie’s Place, a boutique hotel and spa in Usaquen. It’s probably not for everyone – people who want to be in the middle of the tourist areas of Bogotá should stick to La Candeleria. Business travels on large expense accounts can head to the big-name chains. But for people like me, who want to be in the north side of Bogotá, around Barrio Chico and Usaquen, Charlie’s Place is ideal. With just 22 rooms, the hotel is very cozy and accommodating. The manager, Wilson, is a Minnesota native and is delightfully charming and easy-going. The rest of the staff including Daniela and Javier are equally polite, friendly and helpful. 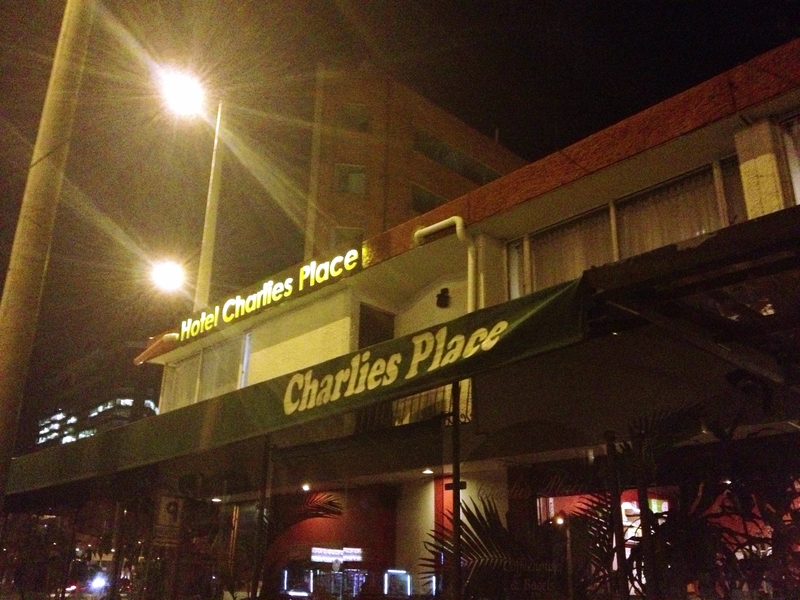 (There’s a reason Charlie’s Place is consistently rated as excellent by Trip Advisor for the last several years.) The best part is that the rates are fair and the service is excellent. Once I was comfortably settled, it was time to get back out and enjoy the brisk weather. (The weather is one of the reasons I love this city!) My first stop was over at SaludCoop where the doctors and nurses were nice enough to answer some questions about the ongoing healthcare crisis. Right now, the public health system, EPS and SaludCoop are going broke. Basically, much of the money paid in by members of the health care cooperative has disappeared (been embezzled), leaving hospitals with bare cupboards. Hospital staff are feeling the pinch as payroll arrives late, in diminished amounts, or in some cases, not at all. (There are rumors that the money was funneled into the purchase of luxury apartments, fancy vacations and the like). There have been some protests and work stoppages by health care workers, but unfortunately, the local unions have been unwilling to support their efforts. Unfortunately, the government seems apathetic to the concerns of the healthcare workers and their patients. The Minister of Health, Alejandro Gaviria went so far as to say that the health care crisis was a “lie” in a recent press conference, following up on his previous twitter (June 2015) and blog comments (Feb 2015), even going so far as quoting Christopher Hitchens in his defense of the health care system. Of course, no where in his statement does he talk about healthcare workers going without pay or operating rooms without suture. But he’s not alone in his apathy. Most of the local politicians couldn’t even be bothered to show up to a legislative session on the issue. Only 9 members of the House of representatives (out of 166) attended. This financial travesty has wide-spread implications beyond just the public health sector (of hospitals and clinics throughout Colombia). Many of the private facilities also rely on payments from the healthcare cooperative. (Imagine if medicare went broke through criminal mismanagement – it would affect a lot more that general and county hospitals). In many cases, these hospitals are forced to write off millions of dollars of nonpayment from the health cooperative. In fact, one of the largest hospitals in Cali (a city of 2.5 million people) will be forced to shut it;s doors, mainly due to losses incurred from nonpayment by EPS and SaludCoop. So it’s a huge mess that will probably only get worse without government intervention. On the flip side of the Colombian Health Care Crisis and the declining peso (over 3200 pesos to the dollar this week) – Hospital Santa Fe de Bogotá appears to be thriving. Yesterday evening I had the pleasure of a guided tour of the new Emergency department at Santa fe de Bogota with the current Chief of the Emergency Department (and trauma surgeon), Dr. Francisco Holguin. Fans of the Bogota book know that I spent quite a bit of time at Santa Fe de Bogotá in the past – and that it is one the highest ranked facilities in all of Latin America, so it was fantastic to see all of the improvements. (The ER was still under construction the last few times I was there). The first thing I can say – It’s big! Big, spacious, brightly lit and airy (especially for an ER). The is good work flow with several large workspaces for the doctors and nurses, instead of the typical traffic jams that occur in older facilities. It’s on the same floor as diagnostics (CT scan, radiology), the operating rooms and the intensive care units which means that critically ill and injured patients can be rapidly transported to where ever the need to go. The spacious department now has 56 beds with an overflow unit for critically ill patients. Several specialists are on-call, in the ER and available 24 hours including orthopedics, trauma and internal medicine. Downstairs from the main ER is the fast track – for all of the non-life-threatening general medicine problems. After spending two days interviewing and talking to people about the SaludCoop problems and EPS – it was nice to leave Bogotá on such a nice note. 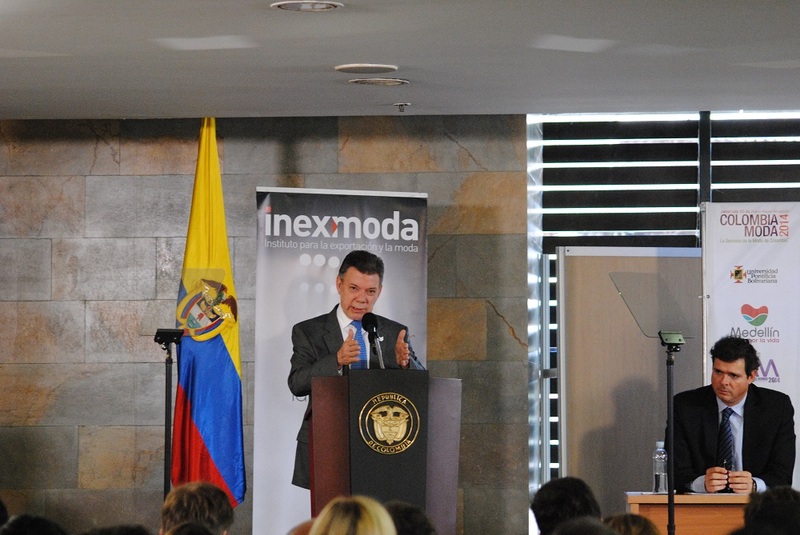 So I am back in Medellin, Colombia for several weeks – but this trip is different from all of my previous visits. It’s the first time I have come here without a specific purpose. I’m not here to interview surgeons, attend surgical conferences or even ColombiaModa. Medellin has become so familiar to me, that when I needed a nice tranquil space to work on a non-Colombia related project – I headed here to get away from the thousands of distractions of my stateside life. While I am here, I am also determined to enjoy and explore more of Colombia since I have just seen the bare minimum of life and locales. 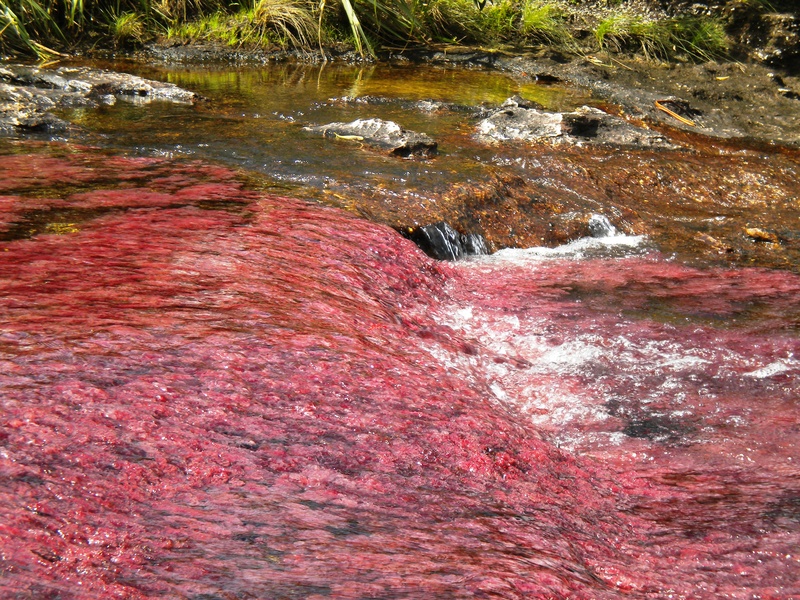 So next week, I heading off to one of Colombia’s best known natural wonders, Cano Cristales. I’m going as part of a group (which is something I’ve never done before). It’s sounds like it will be a great trip – flying to Meta, Colombia in a small plane – to a community with limited electricity and no cellphone or internet service. That doesn’t sound like a big deal, but as I writer, I have gotten used to almost always having computer access – almost anywhere in the world. So this will be a nice break from the ordinary for me. 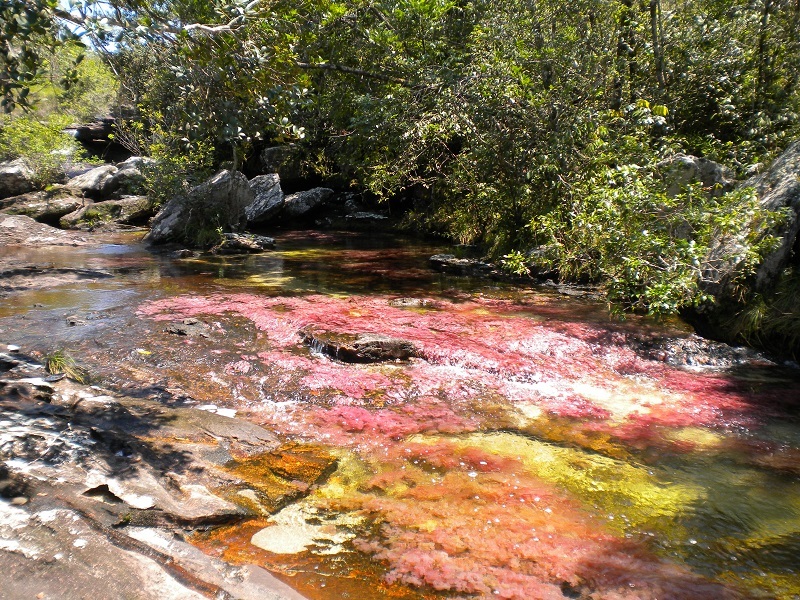 I don’t have my trusty Nikon this time around, which is a shame since Cano Cristales is famed for its beauty but I will attempt to take some pictures with a tiny camera (that packs well). 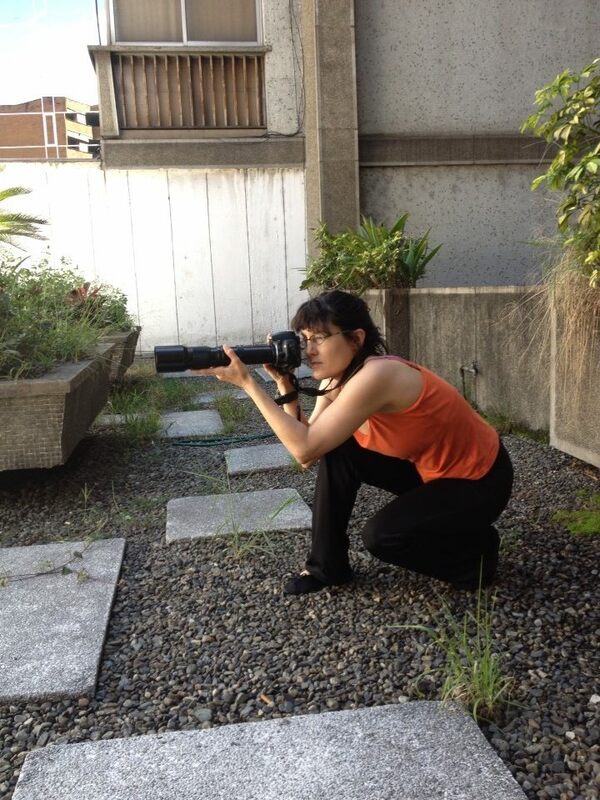 It’s weird because I tend to lose my confidence when I don’t have my big, heavy camera. Naked without my Nikon? Not a great visual, is it? The second time is the charm! My apologies to my dear readers for this late post. I usually write about surgery and surgeons, but occasionally drift into other things.. I visited the new Clinica de Medellin facility in late July, but didn’t have time to write about it before now. 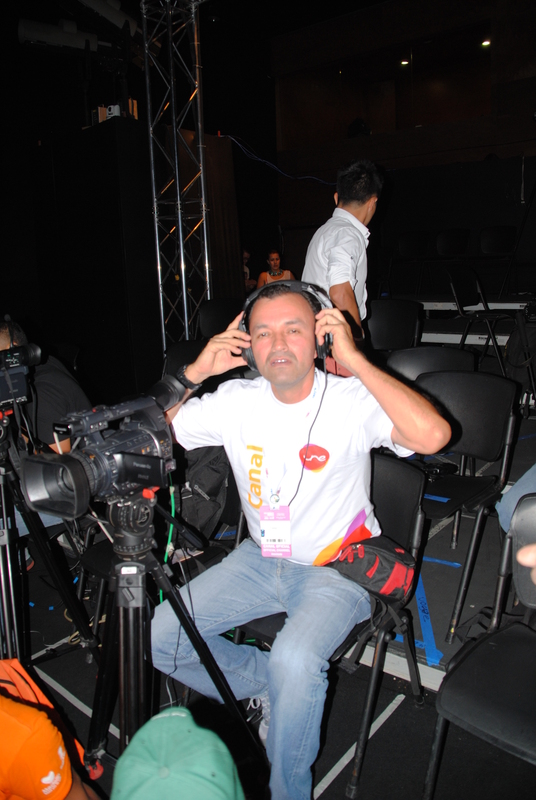 Just before travelling to Medellin to cover Colombia Moda and the ALAT conference, I developed a dermatology problem. As my American readers know, getting an appointment with a specialist in the USA can often take several months. In fact, I was given an appointment in early July for later this fall. However, during my stay in Medellin, my dermatology condition continued, so I decided to give the Clinica de Medellin another try. I had heard rumors about some re-organization of the medical travel division so I decided to use this as an opportunity to verify those rumors. I am very pleased to report that after sending my initial email to the Clinica de Medellin requesting a consultation with a dermatologist that I received a reply that same day (from Adriana Henao – email: ahenao@correo.clinicamedellin.com.co). By the next day, an appointment had been scheduled for the end of the week. The clinic was so new that when I gave the address to the cab driver, he merely raised an eyebrow before starting the car. On arrival, he expressed surprise – and said, “This wasn’t there before.” The Clinica de Medellin Sede Occidental is divided into a hospital and an outpatient clinic area. The smell of fresh paint was still evident in the immaculate, and sparkling facility. The officer at the information desk had me personally escorted to the correct clinic when he heard my American accent (and hesitant Spanish). I waited about fifteen minutes before being escorted into the private office of Dra. Sara Gonzalez Trujillo. She was very friendly and pleasant. We reviewed my past medical history and current treatments before she examined me. She explained the condition in-depth before writing several prescriptions and requesting a lab test. She provided me with a full copy of my medical records to take to my upcoming appointment and gave me her contact information. The labs cost about 25.00. After a quick lab draw, I was given a lab slip with my record number on it. I later received an email with my login to access my results. Since I was headed back to the states, I emailed my results to Dr. Gonzalez, who called me with additional treatment recommendations and an explanation of the results. Since seeing Dr. Gonzalez, I have been using the medications as prescribed – and my condition has improved dramatically. I have been taking the medications as prescribed and it is getting better. I will email Dr. Gonzalez after seeing the dermatologist here to give her an update. To make an appointment with Clinica Medellin, click here. It’s been a couple crazy, busy days here in Medellin. 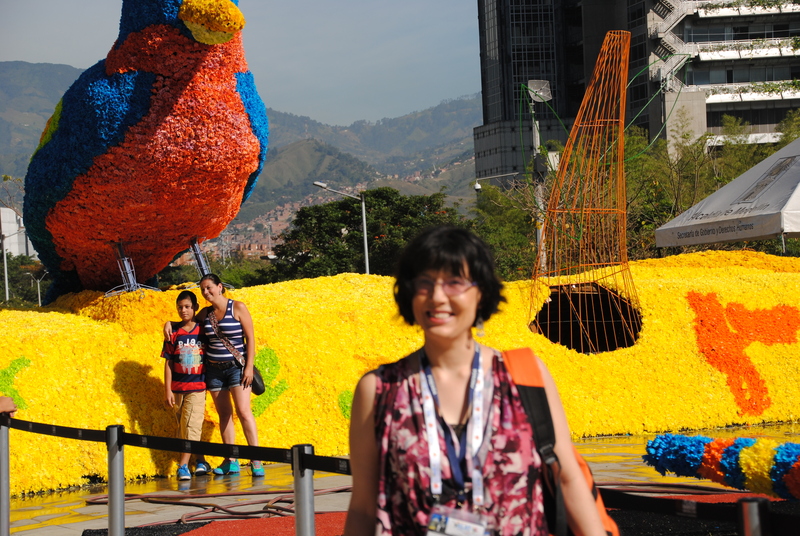 I have a bit of a backlog of posts – from a day learning to finger crochet in a group crochet class, the festival of flowers, a visit to Clinica Medellin Occidente and the ALAT conference. It will take me a little while to post everything before heading home in just a few short days. 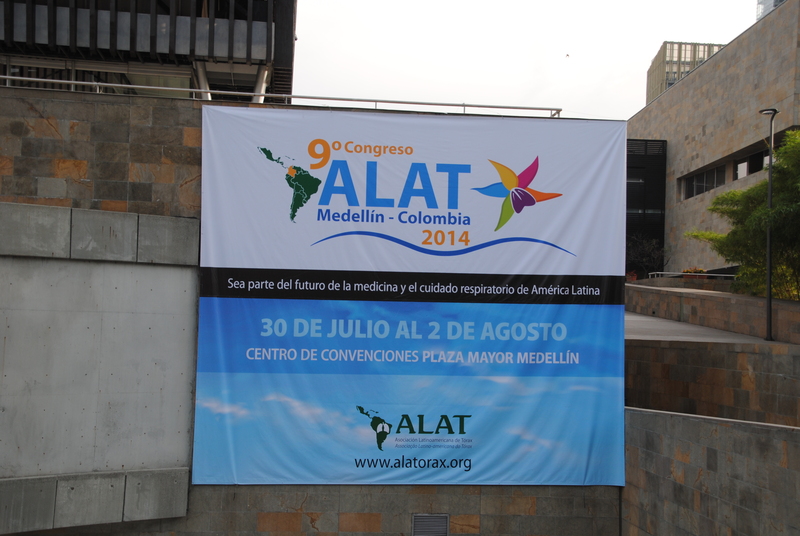 The ALAT conference was fantastic. In addition to numerous wonderful, learned speakers from all over Latin America, it was a great chance to connect with innovative thoracic surgeons from practices all around the world. We also re-connected with surgeons we’ve interviewed in the past – to hear what they have been doing since my last visit. One of these surgeons was Dr. Andres Jimenez at Fundacion Santa Fe de Bogotá (SFdeB). As astute readers of the Bogotá books may remember, our encounters haven’t always been as collegial as they could have been. However, he did grant me an interview, and permit my ingress into the operating room. To my surprise, I found that while he was a hesitant interviewee, he was also a promising young surgeon. With that in mind, I re-connected with Dr. Jimenez briefly to ask about the program. Dr. Jimenez reports that they have started a lung transplant program and recently performed his first lung transplant at SFdeB. Dr. Carlos Carvajal, who was a thoracic surgery fellow when we first interviewed him – is now a practicing thoracic surgeon at Hospital Santa Clara in downtown Bogotá. Dr. Ricardo Buitrago continues his work in robotic surgery at Clinica de Marly. 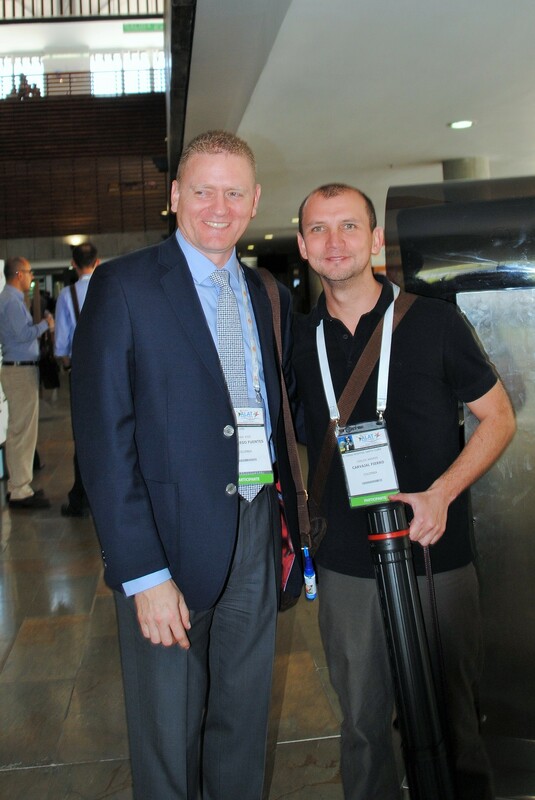 Caught up with Dr. Luis Torres, the young and charming thoracic surgeon from Clinica Palermo. 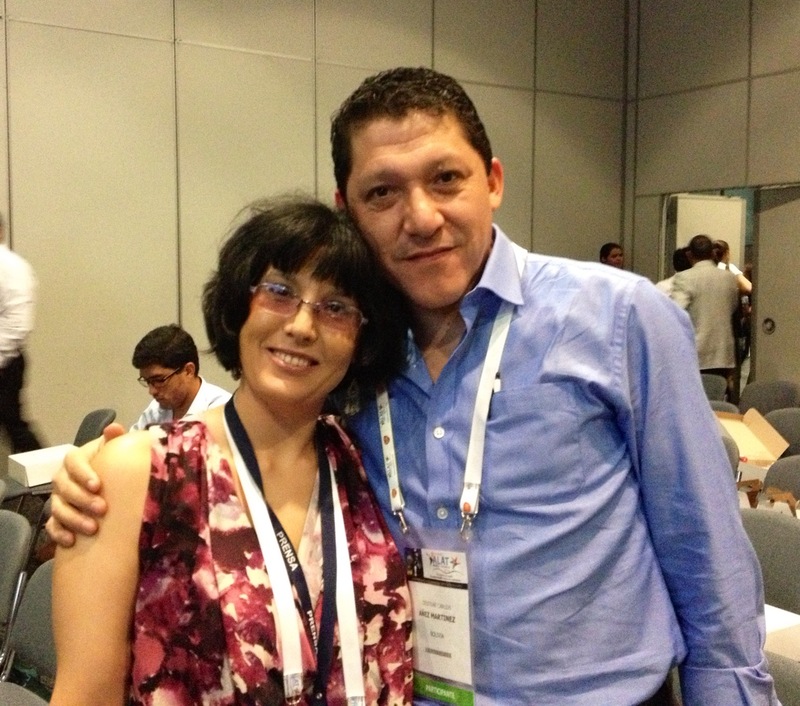 But the biggest surprise at all – was the twinkling brown eyes of Dr. Cristian Anuz Martinez. (The twinkling brown eyes above a surgical mask are all I remembered from my 2012 trip to the operating room with Dr. Frnando Bello in Santa Cruz, Bolivia). We spent some time over coffee talking about the current state of cardiothoracic surgery in Bolivia, his private practice and his colleagues. The conference itself was phenomenal – the amount and range of topics covered – from sleep medicine, tuberculosis, critical care medicine and pulmonology in addition to thoracic surgery. The festival of flowers, one of the largest events in Medellin also started August 1st. The event which is expected to draw 19,000 visitors to Medellin this year – celebrates the floral industry of Antioquia with ten days of events. The events are staggered through out the city and include musical concerts, singing contests, parades, flora displays, children’s events and arts. Tomorrow: Clinica de Medellin – Second time is the charm! During Colombia Moda, I met several American business people looking for more information about fabric and textiles than the small booths could provide. Many of them wanted to go out and see the fabrics, some of the shops and the factories but no one thought to take them to see any of these things. All of the people I met were first-time visitors to Medellin (and some may never be back). I can’t help with factory tours (I’d like to see those myself) but I do live nearby, so I thought maybe I could help provide some information for future visitors to this fair city. Since I thought wandering around El Centro as a first-time visitor without a guide might be a little daunting, this post might help people feel more comfortable. 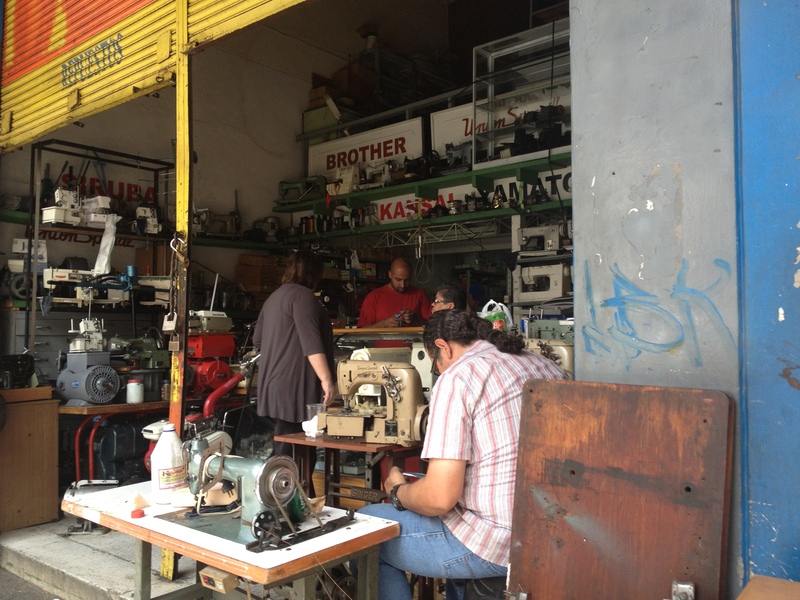 So I spent all day Saturday wandering around the district – to take pictures and be able to provide more information to people interested in finding fabrics and materials while in Medellin. 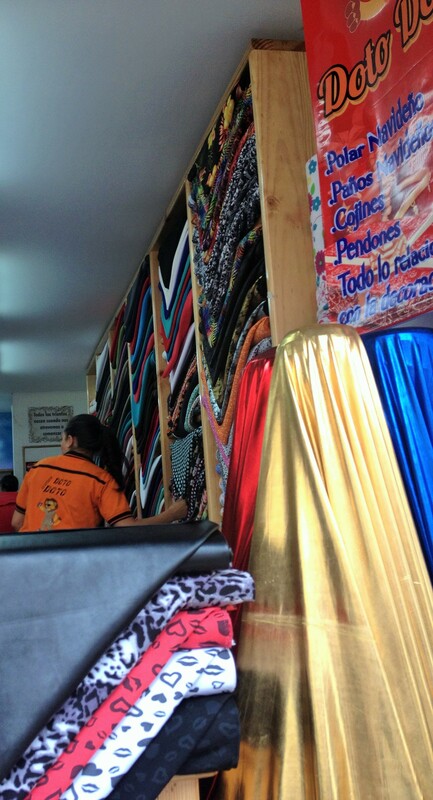 A note about Fabric shopping in Medellin: If you are looking for super cheap – crazy bargains, you probably won’t find them here. 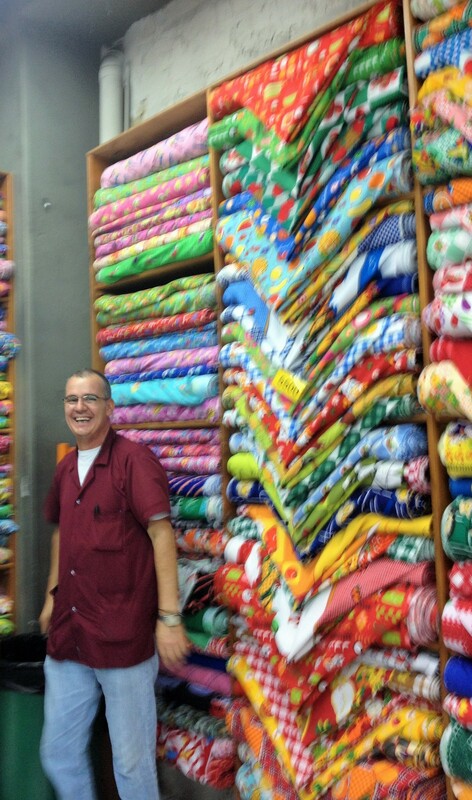 But you will find a huge array of all kinds of fabric – most of it made right here in the city. For someone like myself who is sometimes (okay, frequently) frustrated by the lack of floor space given to apparel fabrics in the United States – (where it seems like 90% of fabric is for quilting and such), it’s still a bonanza. Also, while it isn’t made in the USA (which is increasingly rare, I know) – I still feel a bit of loyalty towards buying locally sourced items – even if Medellin is that source. Still interested? Good. 1. Taxi – if you want to take a taxi, ask him to take you to the Plaza Botero. It’s a few streets away from your destination, but it’s a nice central space – especially good if you are meeting friends or other visitors. 2. Metro Train – the metro train is cheap, clean and quite reliable. It’s also a good way to see a bit of the city. Take the (blue line) train to either Parque Berrio station or the San Antonio station. San Antonio is closer to shopping, but Parque Berrio puts you right at the Plaza. (For more information about the Metro, see this helpful article at Medellin Living). 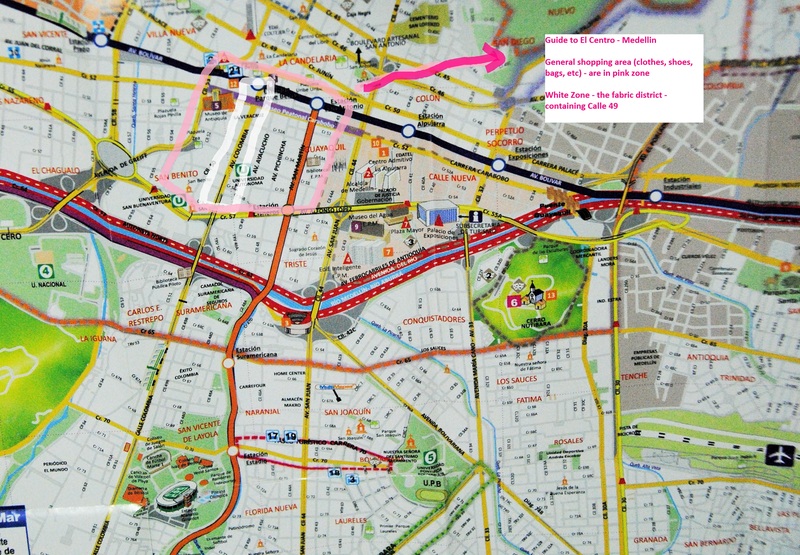 Get a map – Now, I know this is a digital age, but sometimes a paper map is just easier.. Safer too because it makes you less of a target for thieves who prey on upscale tourists for all of our fancy electronic devices. 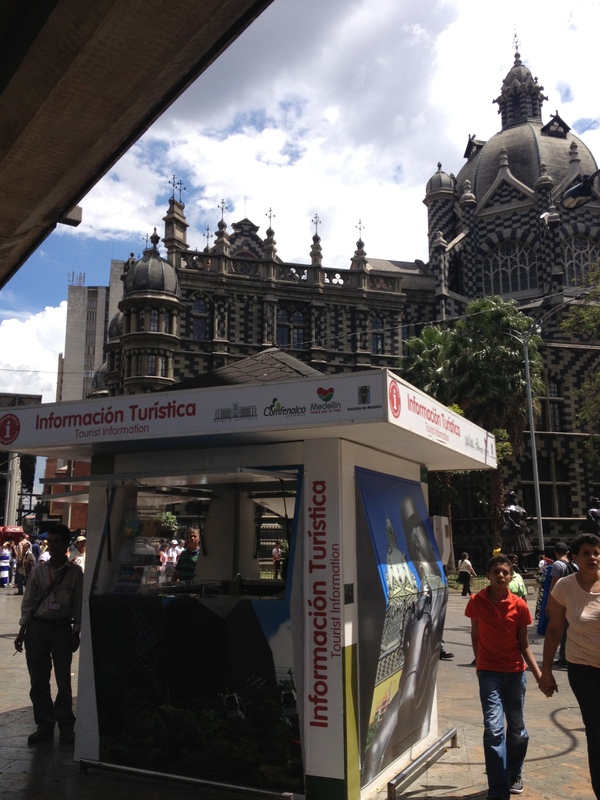 There are several of these kiosks located in/ around Plaza Botero and around the Parque Berrio station. 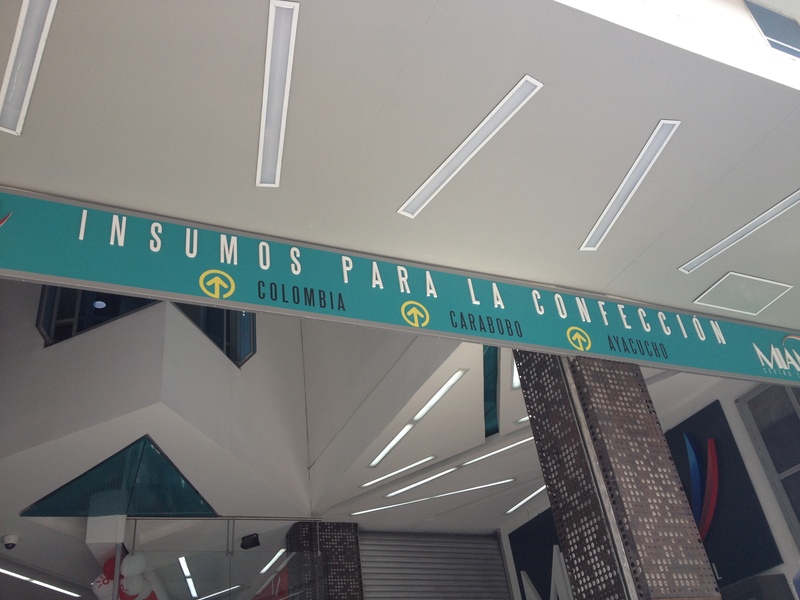 Just ask for a map “Mapa, por favor” and they will be happy to provide you with a free map of Medellin. I used this same map for reference for the shopping areas, to make it easy for visitors to recognize where to go. Navigating the city Places like Medellin and Bogotá are particularly easy to navigate because streets use numbers, not names for the most part. (Once you get used to the system – our system of street naming in the USA seems needlessly confusing.) Everything is basically on a grid – Calles run in one direction and are abbreviated as Cll. Carreras run in a perpendicular direction and are often abbreviated as Cr. It makes locating a business very easy. 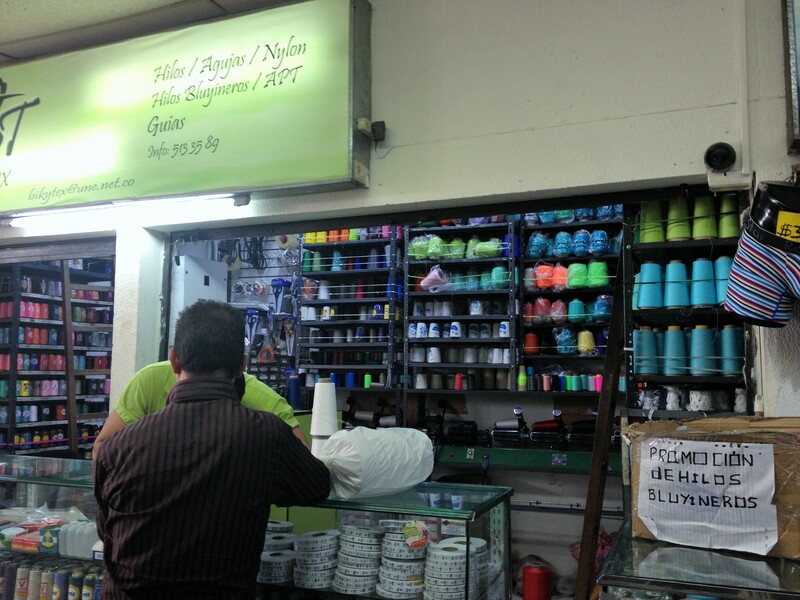 For example, my favorite fabric store in Medellin is Textiles El Faison – and their address is Calle 49 #53 – 101. 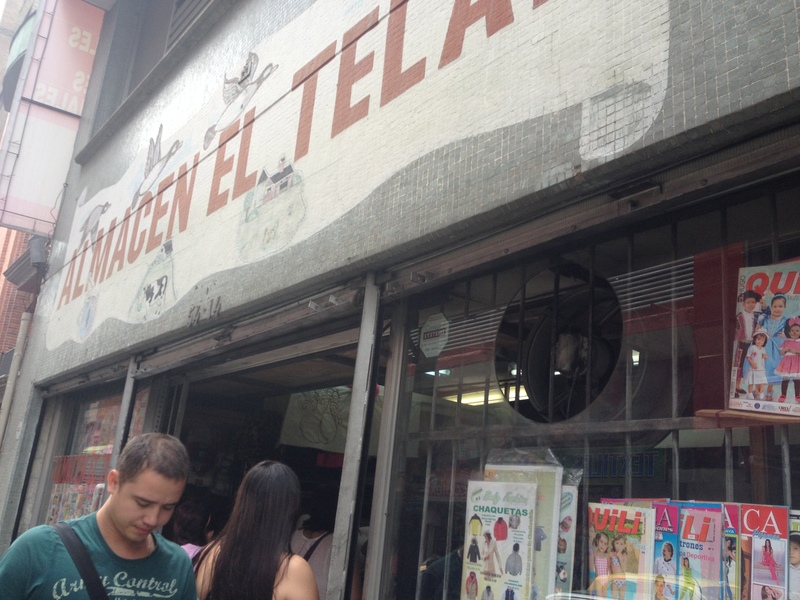 This means that they are located on Calle 49, about 101 meters from the cross-street, Carerra 53. Now that you are here – with your map Walk south towards Calle 49. 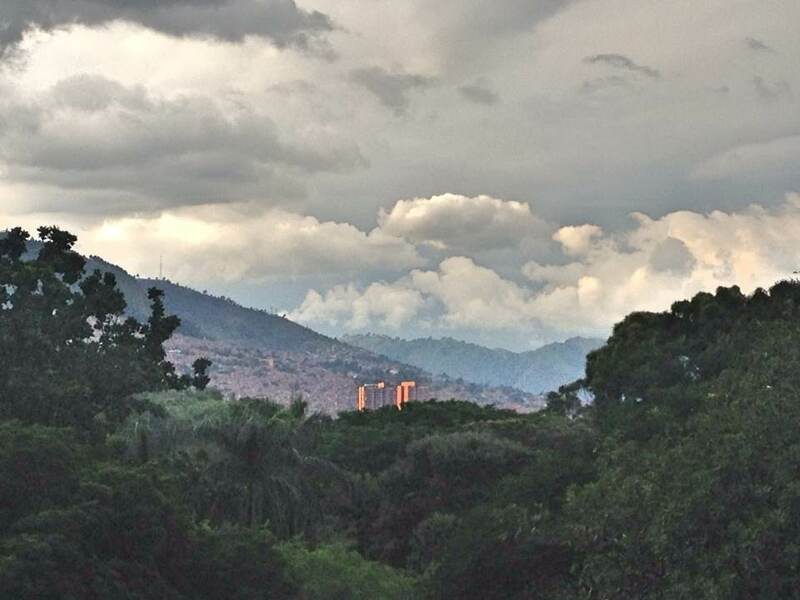 (To orient yourself – remember that Medellin is set in the foothills. If you start walking uphill, you are heading East (the wrong direction) – towards the financial center of Medellin (near where I usually stay). On Calle 49 – turn West (or downwards on a very slight grade) The next several streets will be crammed with shops filled with all kinds of sewing related items – thread stores, fabric stores, sewing machine repair etc. Many of the shops look tiny compared to JoAnn’s or the big craft stores you may be used to. Sometimes they are tiny – but sometimes, it’s just the entrance to a larger indoor mall. 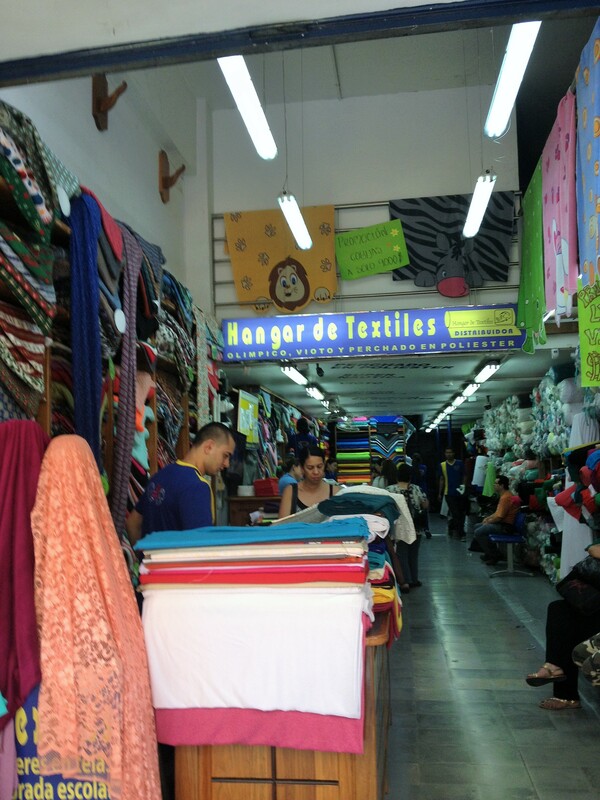 Now, the fabric stores line Calle 49 and many of the cross-streets.. But sometimes notions can be a bit trickier to track down. 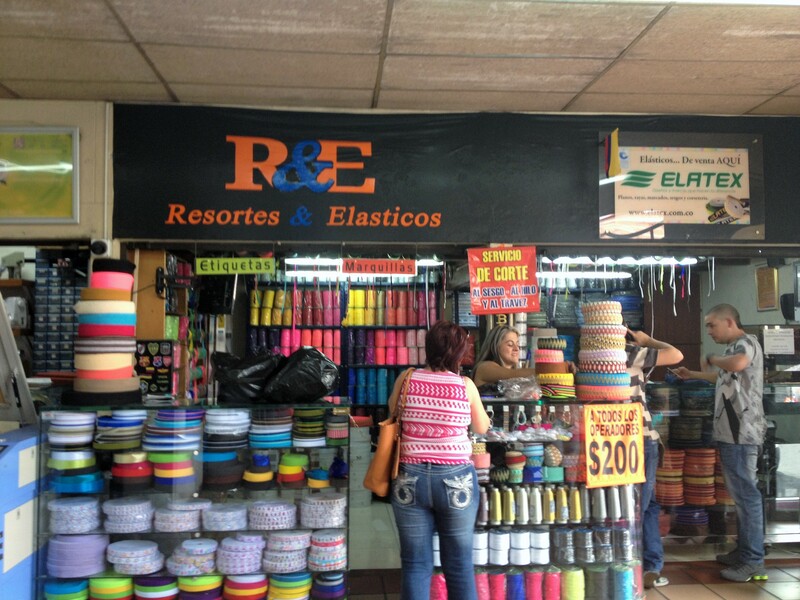 A lot of tiny shops sell just one product – like elastic or ribbon trims, buttons and the like. 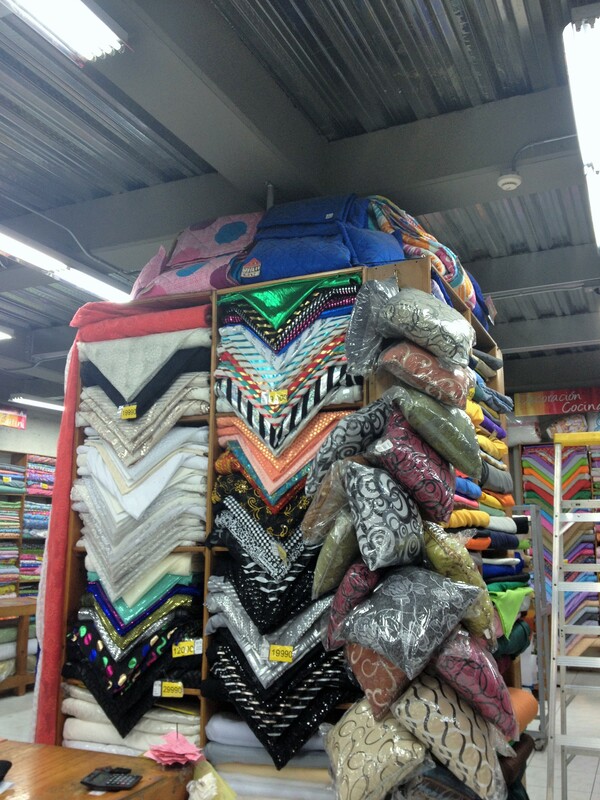 As I mentioned before, my favorite fabric store from my wandering on Saturday – is Textiles El Faison. It’s a big store, and not quite as claustrophobic feeling as some of the smaller shops. (When the shops are crowded, and the fabric piled to the ceilings, I get a bit closed in feeling in some of the smaller shops..) Not that this would prevent me – if I saw ‘the fabric’ there. Lots of great stuff- but limited luggage space, so I move on to the next ones. But for general browsing, or to see fabric in a shop more like what most of us are used to – Textiles El Faison is a well-lit two story shop. Jaime Sosa is the manager there – and he is very nice and helpful. My photos are a bit blurry because I was relying on my small phone (an older model) because I don’t like lugging my fancy Nikon down to El Centro). But that’s not the only great place.. 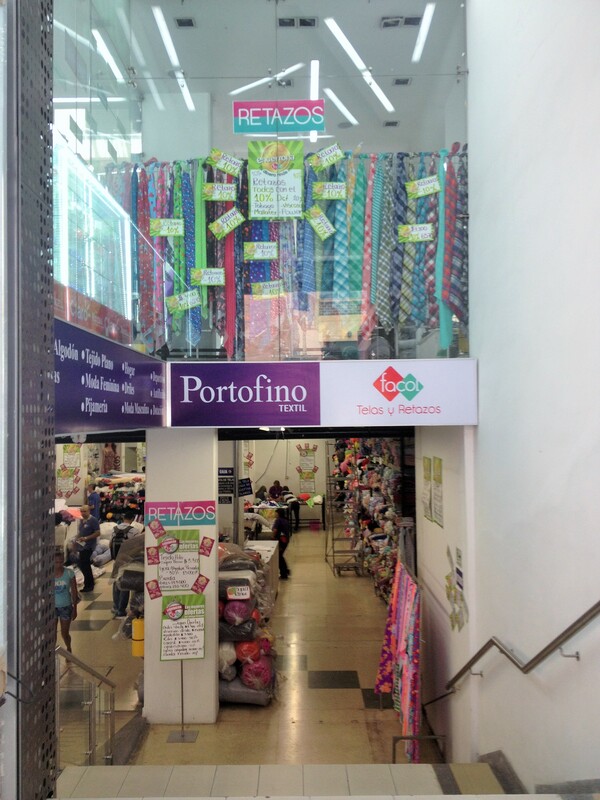 I really liked Portofino Textil too.. It’s located on the ground floor of a little textile mall. 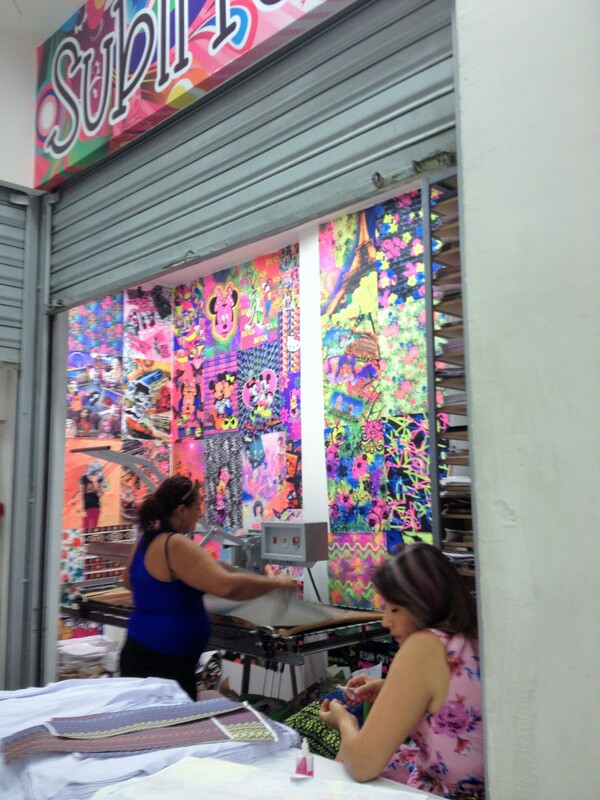 (It’s a very interesting mall – about half the shops sell custom printed fabrics). I was trying to cover a lot of ground, so I didn’t stop in and get all the details on custom printing – even though I saw little storefronts printing the fabric during my wandering. (Maybe I will get a chance to go back and ask some questions.) Custom may be the wrong word since most of it seems to be more like “Small lot pop prints” but at one shop, I did see a customer hand over a jump drive filled with images for printing). But some of the other shops / kiosks didn’t look to have computers just their own style of pop prints (justin beiber, popular artists, other cool designs). Portofino Portofino has more of a warehouse feel – and a two meter minimum. Fabric is priced by the kilogram. I couldn’t resist one of the fabrics there – and my two meters of this lightweight lycra was 0.7kg in total. For an example on prices – the tag on the bolt said 45,000 per kilogram but advertised a discount.. After the discount, my fabric total 27,156. tax added a bit – for a total of 28,350 for my two meters of a 60 inch (or there about width). According to today’s exchange rate – that’s about $15.35 (or around 7.50 a yard since a meter is a couple of inches more.) So, like I said – not a crazy, amazing deal – except that I love the fabric, it was made right here, and it’s certainly not something I’d find at Hancocks or Joanns (if we even had one in my town). It’s actually located under another fabric store but I found it to have better selection, and salespeople that were very helpful and friendly. (Fabien was particularly nice – and patient with my limited Spanish). Portfino Textil #162 Carrera 53 No. 49 – 68 Medellin There were quite a few other shops – so you will just have to make you way down Calle 49 and find your own favorites. 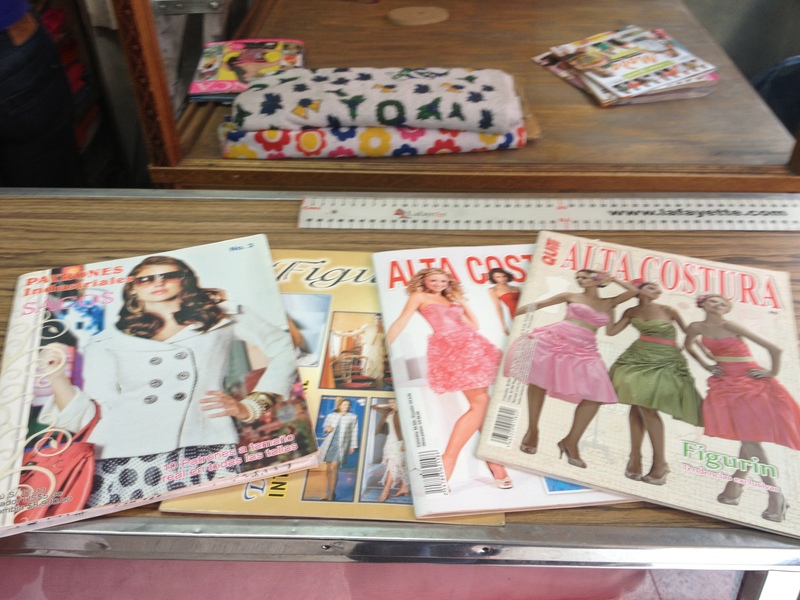 Patterns Pattern magazines can be especially hard to find – but when you do find them – they are a great deal.. Most pattern books contain anywhere from 20 to 200 patterns. It depends on the magazine. My favorites are Bianca, Quili and the more simply named Patrones. Bianca has a lot of the patterns that are hard to find in the United States – like an extended variety of swimwear, lingerie and exercise apparel. They also have a great assortment of patterns made for the new stretchy fabrics; lycra blends and modal. Patrones is a grand brand because it has copies of a lot of the designs by major labels. 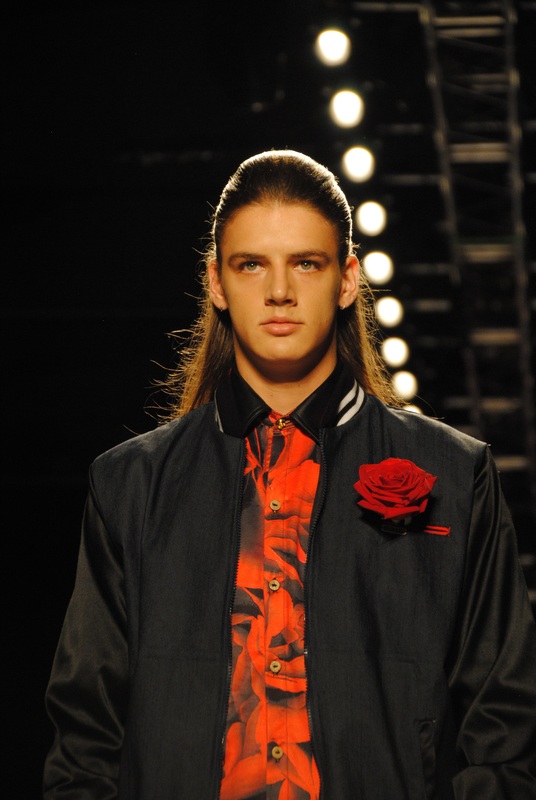 Want to wear your own Dolce & Gabbana? Then patrones is the magazine for you. 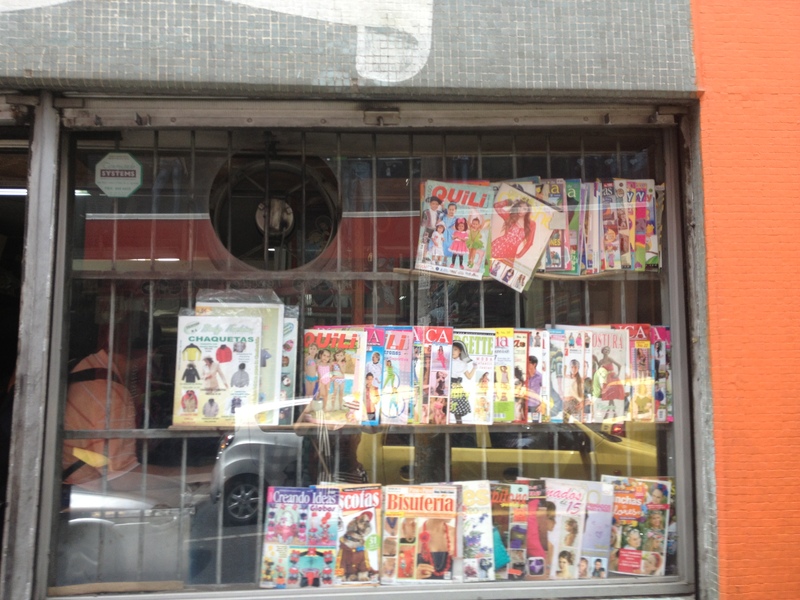 Sometimes you can find the magazines at larger newsstands or bookstores like Panoamericano. Some of the patterns in Patrones are pretty intricate and instructions are limited (and in Spanish) but at 4,000 to 10,000 pesos (2.25 to about 6 dollars) a book – if you are an experienced sewer it is still quite the find.) 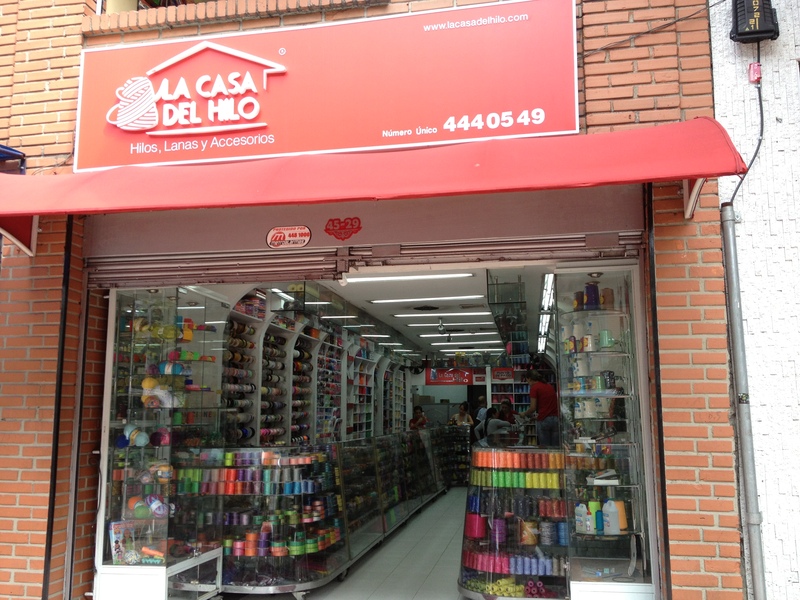 Now – for patterns on Calle 49 – the best place to go is – this little shop.. The place is tiny, so you have to ask to see the pattern books (or point, if necessary.) They don’t have long aisles to browse like some of the bigger bookstores. But the owner is very sweet – and they have a large array of titles available. Now before you head out for your shopping adventure – review a few things to make your shopping more enjoyable and safe. 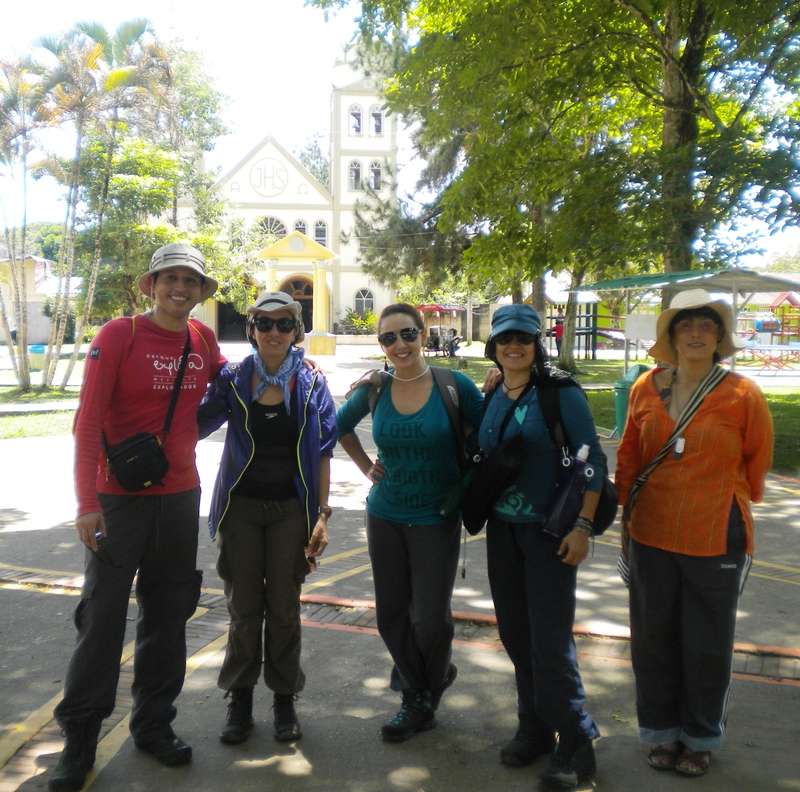 In Medellin – alone or not quite ready to venture into El Centro by yourself? I am always up and willing to lend a hand – if I am in the city. 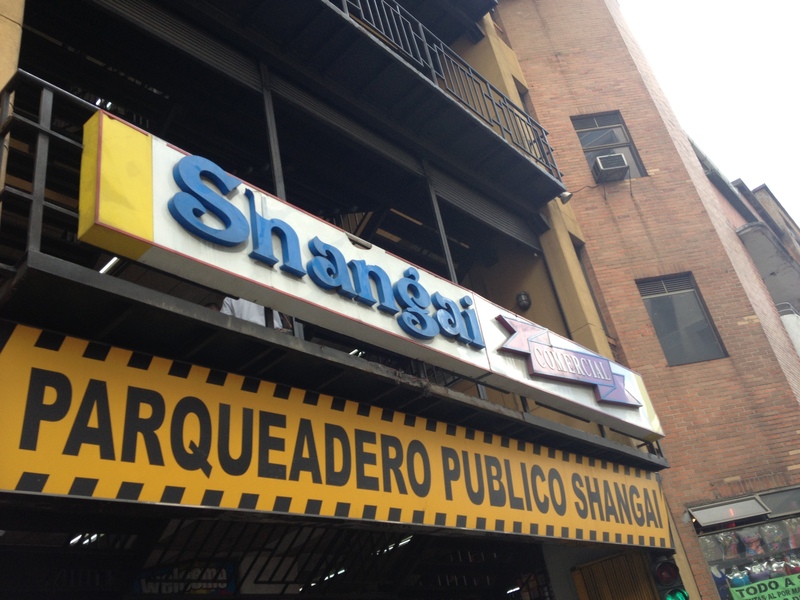 (It’s a good guess if I am blogging about Medellin, then you can find me here.) You can always call me/ text me at 301-706-3929 (If I am not in Colombia, I won’t answer) or email me at k.eckland@gmail.com I’d be happy to arrange to get together for a day tour of the shopping areas. We can check out museums, eat some tasty street food, buy local produce, window shop – or hunt down that one special piece of fabric you’ve been waiting for.. 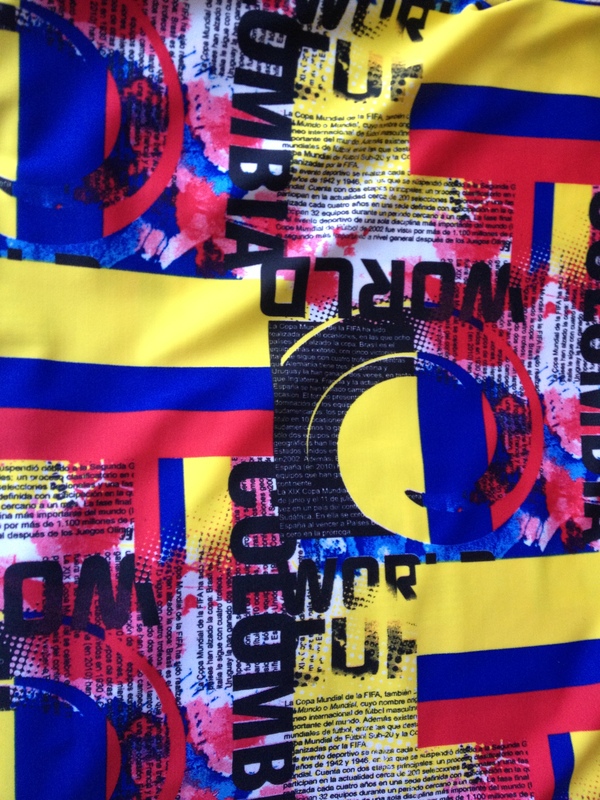 If you don’t catch me on this trip – I’ll be back.. I’ll definitely be back for Colombia Moda 2015, so if you come a few days early (in July) we can have some fun. Now that it’s over, I can say it’s been another wonderful week at Colombia Moda: I met Miss Colombia (she seems sweet) and took a picture of the President of the Republic.. I even say hello to one of the models (since we were heading down the hallway) and we had a nice conversation. It’s funny – I guess I always get intimidated by people taller than me, etc.. and I guess sometimes the expectation is just that models aren’t that nice.. But nothing could be farther from the truth. Luis Martin – a local model from a neighborhood here in Medellin was very nice, sweet and pleasant. It must be weird for him – I mean, his face is really familiar to me – after two years of seeing it thru my lens.. I wish we hadn’t be racing down a hallway – I would have liked to get a photo because he looks better in his own clothes..(Better sense of style). Anyway, I thought it was nice of him to make conversation with a random gringa.. (We talked about Virginia of all things). So – I wish him the best luck, and hope he makes the cover of Vogue one of these days. 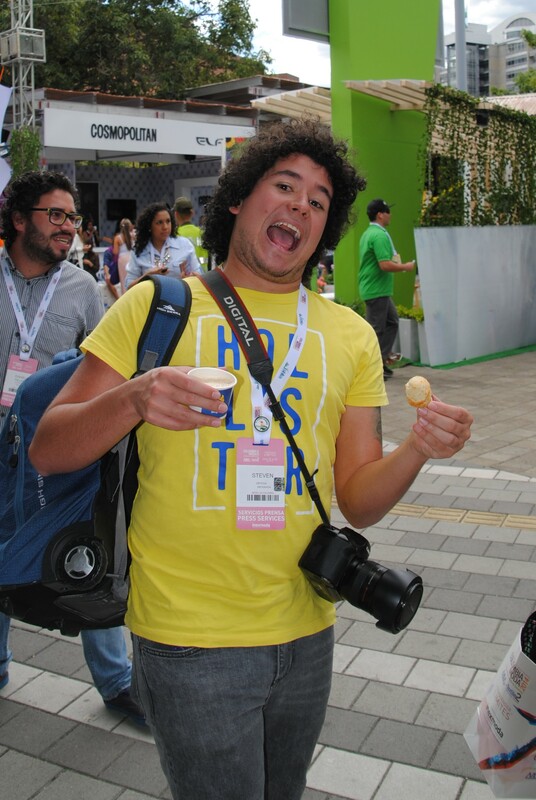 Yesterday was the last day at Colombia Moda, and I don’t have enough nice things to say about all of the photographers and videographers there. They are the reason I came back this year. Instead of treating me as an outsider, they have always been welcoming and kind. This year it was great to be back and see old friends like Stiven and Fredrico. I didn’t see some of the wonderful people from last year, like Estaban who kept me in laughter and good humor even when every bone in my body ached from long hours in contorted positions. That’s the handsome Juan Carlos, the charming Danilo Gallego and the ever kind Hernan. For the entire fashion week, they allowed (and encouraged) me to take one of the plum floor positions beneath their cameras – in the dead center position of the runway. People with better equipment than my starter Nikon can take sitting positions and even rise up on the press bleachers, but without this prime spot on the floor – I’d have been toast. I never would have been able to capture 1/10th of the images that I’ve used in my recent articles. I’d love to do a real (in-depth) articles on the videographers and photographers here at Moda, but it looks like I’ve already been scooped which I think it really cool. Yesterday, the reporter from Une canal turned the tables of the videographers and interviewed them before one of the runways. I am hoping to see Juan Carlos, Danilo and Stiven at some future events here in Medellin before I leave in August.. If not – I’ll see you next year!